The Monterey coast, home to an acclaimed aquarium and the setting for John Steinbeck’s classic novel Cannery Row, was also the stage for a historical junction of industry and tourism. 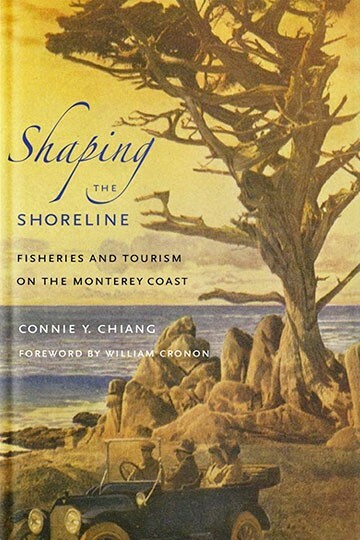 Shaping the Shoreline looks at the ways in which Monterey has formed, and been formed by, the tension between labor and leisure. Connie Y. Chiang examines Monterey’s development from a seaside resort into a working-class fishing town and, finally, into a tourist attraction again. Through the subjects of work, recreation, and environment – the intersections of which are applicable to communities across the United States and abroad – she documents the struggles and contests over this magnificent coastal region. By tracing Monterey’s shift from what was once the literal Cannery Row to an iconic hub that now houses an aquarium in which nature is replicated to attract tourists, the interactions of people with nature continues to change. Drawing on histories of immigration, unionization, and the impact of national and international events, Chiang explores the reciprocal relationship between social and environmental change. By integrating topics such as race, ethnicity, and class into environmental history, Chiang illustrates the idea that work and play are not mutually exclusive endeavors.